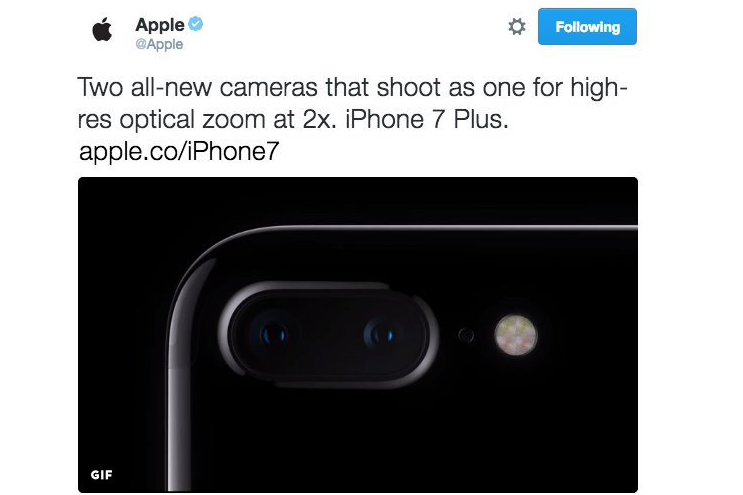 The tech company spoiled its own announcement with a mistimed tweet about the iPhone 7. Doh! We waited, we watched, and finally Apple tweeted – only to take it down moments later. The technology company appeared to have spoiled its own announcement when it released a short video unveiling the iPhone 7 during its much-speculated-about annual fall event on Wednesday. Seemingly meant to coincide with a live announcement by CEO Tim Cook at the San Francisco event, the video confirmed the latest iteration of the smartphone is water-resistant and has a dual camera, stereo speakers, and a longer battery life. Apple took down the tweet in mere minutes, but many members of the media caught the miscue. Prior to the event, which kicked off at 1 p.m. EST, and even before it "officially" tweeted, Apple sponsored the #AppleEvent hashtag. The bourbon brand unveiled its own wearable on Wednesday, the Jim Beam Apple Watch, described as "the world’s most innovative drinkable wearable." The watch, which is actually for sale for $17.99 packs a 1.5 oz shot glass right on your wrist. However, the promotion for Jim Beam Apple does not tell time, track your exercise, or allow you to respond to messages. The brand also created a video to promote the Jim Beam Apple Watch.